The classic hard rock band Rainbow was formed in 1975 by former Deep Purple guitarist Ritchie Blackmore and rising lead singer Ronnie James Dio. The mystical lyrics and extended guitar jams were the perfect match for hard rock success as the duo released three studio album and two live albums during their four years together. Dio would eventually leave to join Black Sabbath, which left Blackmore to find a new lead singer. English rock singer Graham Bonnet was just about to join British rockers Sweet, before Blackmore snatched him up for his latest line-up of Rainbow. The two years that Bonnet worked with Blackmore were the most successful for the band and they produced the album "Down To Earth," which spawned the Top 10 U.K. single "Since You Been Gone." Hot on the heels of the success of the album, Rainbow hit the road, headlining the inaugural "Monsters Of Rock" festival in 1980. 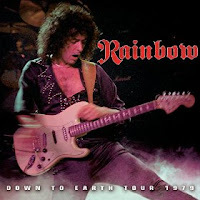 On August 21st, Cleopatra Records gathered together three shows from Rainbow's 1979 "Down To Earth Tour" for a new 3CD box set. The three shows featured in this set are from Denver, Long Island and Chicago. The setlist of the three shows is almost identical, but the performances of each show needs to be heard in their entirety, on their own. Blackmore's guitars are blazing during the solo of "Eyes Of The World," while Bonnet leads the charge of "Since You Been Gone." The drums of Cozy Powell and keyboard wizardry of Don Airey turn "Lost In Hollywood" into an epic masterpiece, especially with their 26-minute performance in Long Island. All three discs close with the quick attack of "Long Live Rock 'n' Roll" as the band shines with a renewed sense of success.